Ns Olah passed away yesterday after a year with pancreatic cancer. (Ns is short for Nicholas, he had a bunch of other eccentric abbreviations for his name over the years, N’s, N’k, Nik, etc.) I met Ns in college, maybe 25 years ago, and last saw him in person about ten years ago at an Origins gaming convention, though we occasionally chatted by email or Facebook since then. 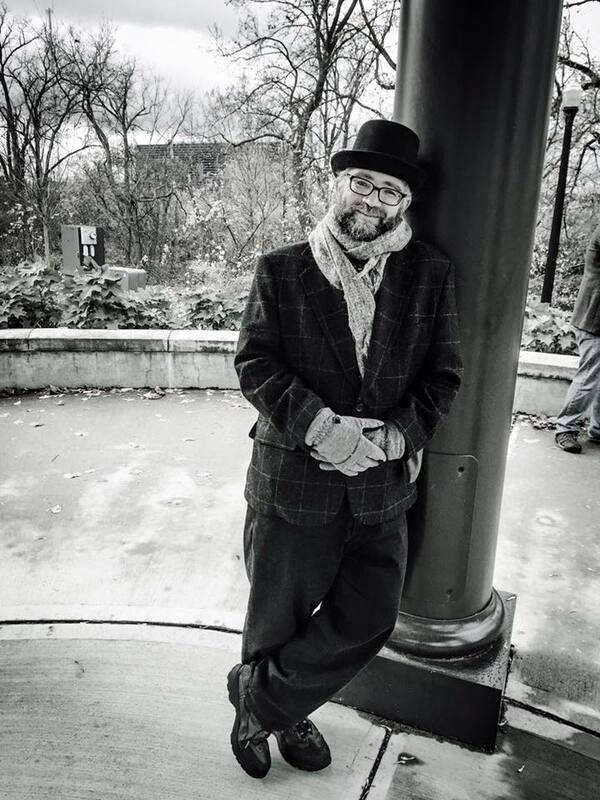 Ns was always the kindest, funniest, most enthusiastic person in the room, and was joking right up until the end, signing off of Facebook to enter at-home hospice with “Smoke ’em if you got ’em folks.” His incredible attitude about what he knew full well was a terminal diagnosis gave a lot of us hope that he’d beat the odds. He’s been memorialized much more eloquently by people who got to spend more time with him and know him better than I did. He probably had hundreds of people who counted him as a friend. He treated everyone he met as one, and the world really needs more people like him. I knew him mainly through gaming but he had many passions, including bicycling, and he’s profiled and interviewed here on one of his last big rides. I can give him no better tribute than to ask others to listen to what he has to say. Though I haven’t really blogged about it, my gaming group was in an ACKS campaign my brother ran a good four years ago. I found this old post draft and updated it for grammar (past tenses). I really ought to find our adventure logs for that campaign. It petered out too soon, due to non-game responsibilities. Everyone is expendable but me. Always act on the assumption that there should be no surviving witnesses. Kill first, we don’t remember the question. Dungeoncrawling with minimum armor for minimum wage is what you get for not finishing fighter-school. Dak [the barbarian and only fighter type] enters rooms first, at least until we run out of healing compresses. We don’t check for traps. That’s why the hirelings are at the front of the marching order. The hirelings do not need to know this at time of hire. If you make us bribe you, we will eventually screw you. Another player condensed these values into a mission statement to help keep us on track. The mission of the Oakhurst Marauders is to enrich themselves at the expense of the hired help, frustrate the lawful desires of the local constabulary, to always strive to test the theoretical limits of a ‘Bag of Holding,’ and to allow for the continuing personal development of war dogs by putting them unnecessarily in harm’s way. Also, to burn things. There’s currently a Kickstarter to republish the long out-of-print ancestor of GURPS: The Fantasy Trip. I was really into GURPS for quite a while, ever since I got the Man to Man book (a sort of “preview” of GURPS published as a stand-alone arena game). I lost a lot of enthusiasm for GURPS when the complexity grew to the point that their were separate books for players and GMs. I saw the ads for Melee and Wizard in Dragon magazines back in the day but never saw them is stores or had any idea what they were about. When the first edition of GURPS was published (as a boxed set with two stapled booklets that did not even have covers!) there was something about The Fantasy Trip (TFT) in the introduction but I didn’t pay any heed. I finally learned about the game in the late 1990s or early 2000s when some fan sites started posting scans of the rules. Intriguing, but GURPS was already filling that niche and why go backward, right? When I heard Steve Jackson reacquired the rights to TFT, I was a little excited and convinced my gaming group to test out Advanced Melee — the combat system from TFT with no frills. We liked it quite a bit. So I’m pretty excited about the Kickstarter, because there is the option to subscribe for a seriously packed “Legacy Edition” boxed set that includes the minigames Melee and Wizard, the full RPG In the Labyrinth with three modules, and a lot of extras like play mats drawn by Dyson, a GM screen, and dice (“I want it all” level) plus possibly more stretch goal add-ons. I really like TFT‘s simplicity. The basic mechanics are rolling under a stat or score on 3d6, with possibly more or fewer dice depending on the difficulty of the task. Weapons all do fixed ranges of damage, with strength just counting for hit points and allowing use of bigger weapons. This seemed like a terrible idea to me at first, but it has grown on me. Characters advance more like GURPS than D&D: XP are used to buy new talents/skills/spells or increase attributes. Characters can do fairly superhuman things eventually, but they can also always get killed by lesser foes who are lucky or clever. The reports on longer campaigns seem to emphasize that the mechanics, being simple, tend to take a back seat to story, but being so tactical they also allow dramatic action for combat. Sounds like a winner. My only concern is how much ‘planning’ is necessary in character generation. I never liked 3e D&D for that reason — your choices early on tend to drive what your options are later. But TFT does have some “unlearning” rules, at least for spells IIRC, so it may bem ore flexible than it looks. In just eighteen days we’ll be celebrating the nativity of the Krampuskind! Left to right we see a manger animal (Reaper Miniatures), an angel (Ral Partha), Krampusjoseph (Heritage Models), the Krampuskind (Dollar Tree), Krampusmary and two magi (all Metal Magic), and a third magi (Grenadier). Readers of my book will know that St. Nicholas has a grave in Myrna, Turkey, a tomb in Kilkenny, Ireland, and shrines in Bari and Venice, Italy — each of the Italian shrines containing fully one half of his skeleton. He also has a sacred cave near Bethlehem and an island named after him which is known for its ever-sharp tools. I assume there are suitable festivities going on in all those places right now, December 6th, his feast day. Among his miracles are saving ships from storms and raising three boys who had been mummified* from the dead. *or pickled, in some versions of the story. Maybe you’re on the market for a piece of the True Cross? But wouldn’t you rather get your relics the old-fashioned way — plundering catacombs? 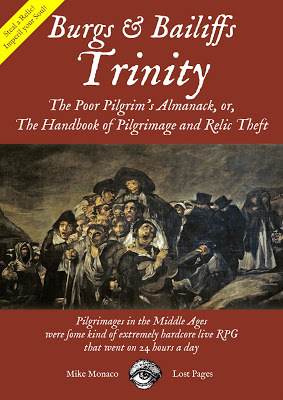 If so, you should buy The Poor Pilgrim’s Alamanck. Tons of information to help you add relics, miracles, pilgrimage, and catacombs to your D&D game. Makes a great gift for Christmas, Yule, Kwanzaa, birthdays, Hanukkah (buy eight! ), or Decemberween. I could probably develop this into a more detailed and nuanced argument, but here goes with some thoughts as I kill ten minutes at my desk, when I should be on my way home but have an after-hours union meeting to wait around for. Just a contrarian thought. Elves always seem to be a go-to choice for rangers because most versions of D&D give rangers some extra skill with bows, and elves have bonuses to hit with long bows at least in AD&D. Rangers are also associated with the outdoors, and elves love nature, right? Going back to the first instance of rangers in a D&D manual (the AD&D PHB), we just have this laconic description before jumping into their abilities and powers: “Rangers are a sub-class of fighter who are adept at woodcraft, tracking, scouting, and infiltration and spying.” Their powers revolve around killing “giant class” monsters (generally speaking, humanoids/goblinoids, and not including giants but including ogres and trolls), tracking, and some spells. Their increased chance of surprise would make them pretty deadly with bows under first edition surprise rules. But apart from limited druid spells and attracting woodland followers, I’m not really seeing the nature-loving aspect to them. They look a lot more like Tolkien’s rangers, who protected mankind by patrolling the frontiers. Rambo more than Robin Hood. Why would elves be protectors of mankind? The first edition restriction that elves can not be rangers makes sense in this light, especially if you mix in some of the Poul Anderson ideas about elves being not so friendly to humans. D&D druids are fleshed out a bit more, but the basic idea is that they are throwbacks to Celtic druids (as described by Julius Caesar? ), and worship trees, the sun, and moon. Bearing in mind that AD&D elf characters are always high elves, the shouldn’t be druids. Druids sound rather backward; a refined elven culture certainly wouldn’t be worshiping nature directly, but would have developed a pantheon of gods, as we see in Deities & Demigods. Even if wood elves are allowed per Unearthed Arcana and post-1st edition versions of D&D, wood elves don’t seem any wilder or more primitive than high elves, just different. Druids are tied, minimally, to a certain kind of semi-barbaric human civilization. (OK, barbaric according to Julius Caesar’s Gallic Wars, which was propaganda, but we’re buying the myth anyway by making them tree-worshipers). Elves are not Celts or Gauls. Rangers are also tied to human civilization, as a sort of frontier defender of humans. Again, not a role you would see taken by up non-humans. In this light, half-elf rangers make a little more sense (and really half-orc rangers make more sense than elves, while we’re at it) — half-human outcasts might be deployed to the frontiers, hidden from prejudiced eyes and laboring to defend a wold they are not really accepted by. So whenever I see people say it just “makes sense” to allow elves to be rangers and druids, I shake my head. It makes sense only if you divorce those classes from they actually represent and focus solely on the “nature” part of their roles. But both classes actually serve humanity; they simply do so on the fringes of civilization, in the wilds. When I was painting up all those pirates and swashbucklers over the summer, I also tried to pull together all the aquatic monsters in my colleciton. It turns out there weren’t all that many unless I count plastic and rubber animals which could be giant crabs, octopodes, sharks, and that sort of thing. Here’s what I did have to paint. 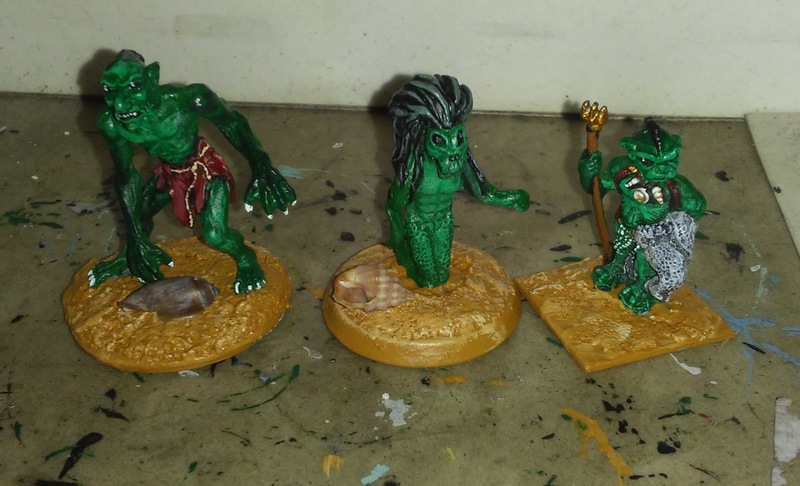 A Reaper marsh troll, a TSR scrag, and Grenadier sahuagin. I spent the most time on the sahuagin, since he’s got a lot of gear, and the Monster Manual description mentions that they are lighter in front, and dark in the back, which makes sense for a fish-man; really almost all animals are lighter on their bellies/undersides and darker on top, as camouflage in the water. I think land animals might retain that as a leftover from evolution. The eyes are described as shiny and black (dead eyes like a doll?) so I just put a couple of dots of white to suggest a glint. The troll I painted similarly. I believe I read that sahuagin leaders are larger, so the marsh troll is especially suitable on that count, though he should maybe have some equipment. 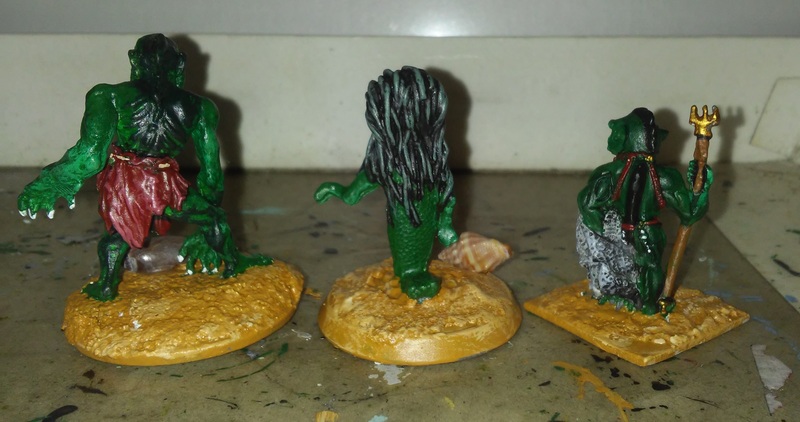 Before doing those guys, I also painted a pair of mermaids (clear plastic drink hangers), a merman (some kind of rubbery gumball machine toy) and another scrag. 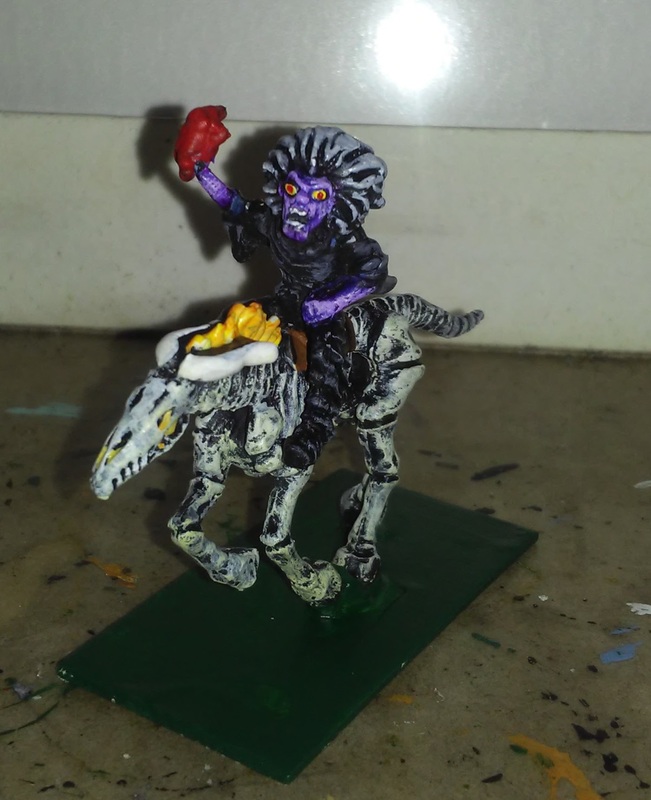 Not sea-related but I also repainted a MageKnight figure that I assume is some kind of night hag on a nightmare. I think that’s some kind of organ she’s hurling. A little big for a heart … maybe it was supposed to be a fireball? 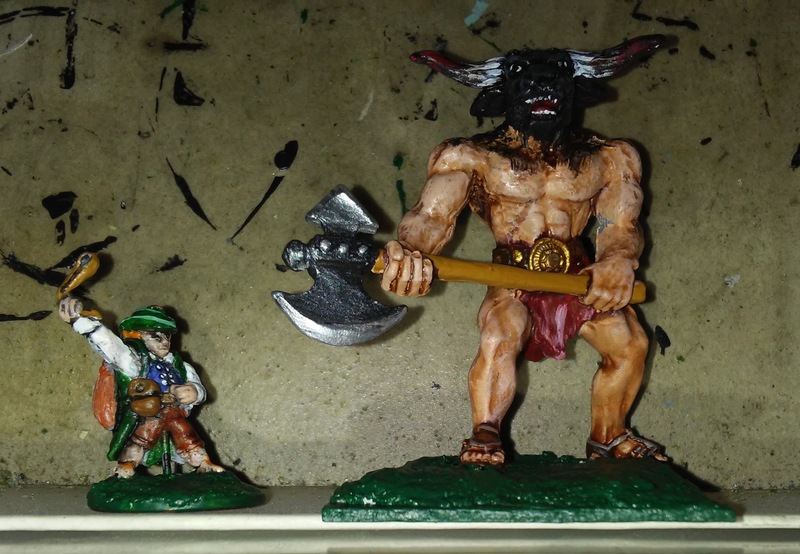 On the left, an Asgard halfling; right, a Reaper minotaur by Sandra Garrity. The only thing these two have in common (apart from being painted the same night) is that both were purchased at conventions. The halfling was purchased at Neovention, a fairly big convention that used to be mostly held at the University of Akron. 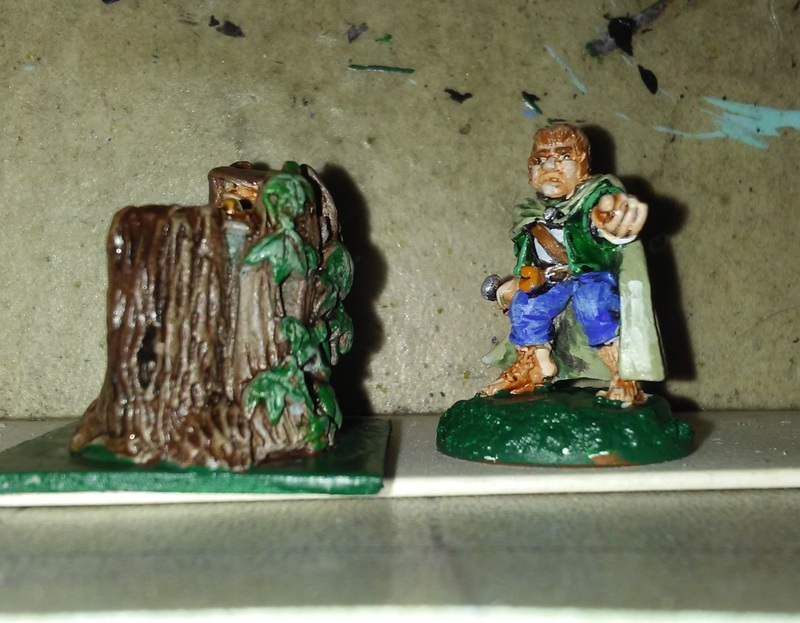 I went to it once or twice in the late 1980s with my brother and some friends, and vaguely recall buying some loose miniatures including this halfling and some furniture that might have been old Citadel stuff. The minotaur I picked up for a buck (!) at Origins maybe ten years ago. The same vendor had some old TSR miniatures (I bought a bunch of them) and various other clearances figures. 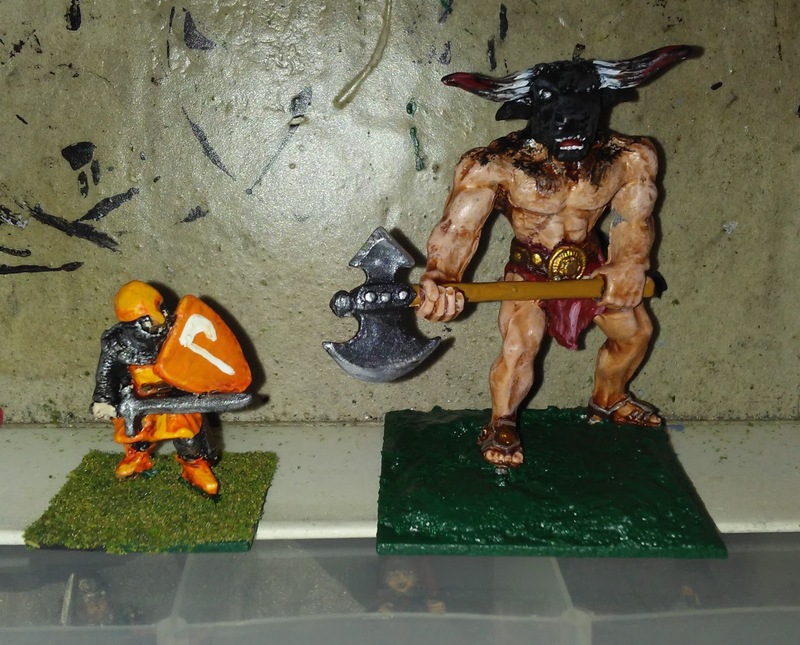 Here’s another view of the minotaur next to a Heritage man-at-arms for scale. 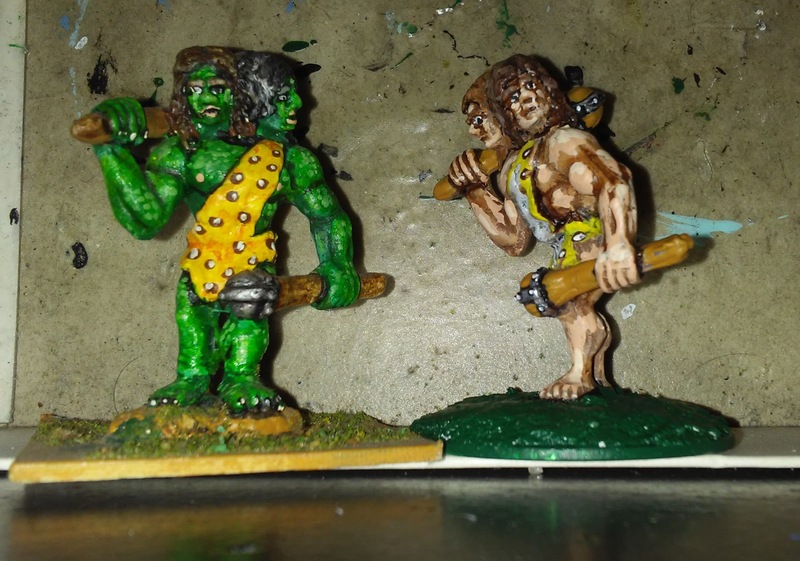 Next up two Grenadier ettins. I painted the green one maybe 10-15 years ago. Green because he’s a bit short for an ettin but reasonable for a two-headed troll. He’s also one of the few figures I tried stippling on, to increase the depth of his relatively smooth limbs. The other one I painted more recently. He looks a lot more stooped because I never tried to straighten him out — the green one has had his ankles broken and reglued many times because I tried bending him and the leas just snapped. A lot of Grenadier castings were fairly brittle. I’ve read that they used lead from a lot of sources, including printer’s type, and maybe that had something to do with it. Finally, two more sneaky hobbits! 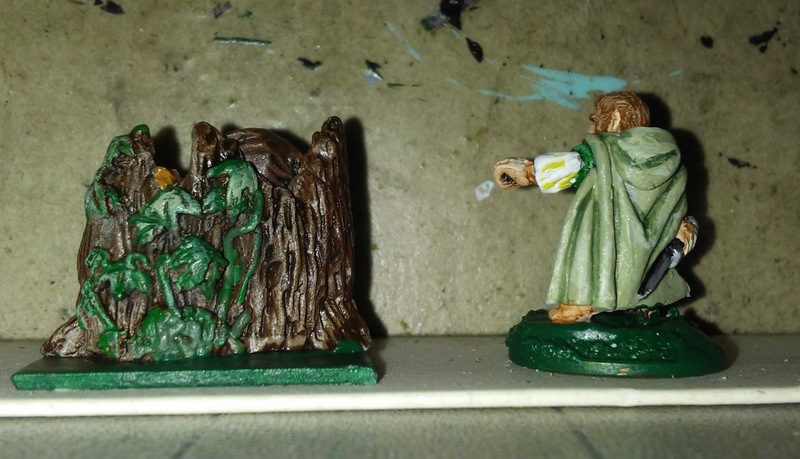 On the left, a halfing from the Kenzer & Co.’s Hackmaster line (now produced by Ral Partha/Iron Wind). 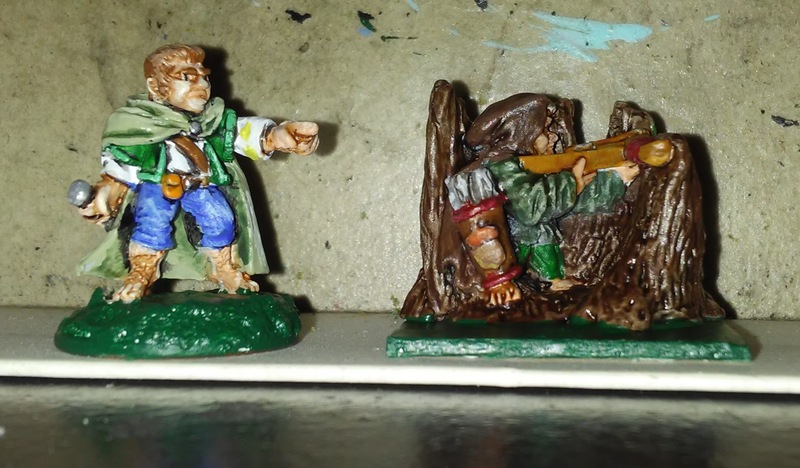 On the right, a halfling sniper from the Grenadier Woodland Adventurers box. Almost all of the Hackmaster minis I have I bought another time at Origins. The Kenzer booth had loose minis relatively cheaply (I bought one of every type of PC they had; no monsters at that time). The guys also gave me and my brother free copies of the Hackmaster PHB; I think Tom bought the DMG. The Woodland Adventurers were a Christmas gift in 1981 or 82. There were a few repeats of figures in other sets, I think, but overall a great variety of elves, gnomes, and similar.